Custom Corporate Marketing & Promotional Materials in North Hollywood, CA | Corporate Impressions LA Inc.
We provide virtually any product or service imaginable to communicate with your clients, customers, employees, stockholders, or vendors. We're experts at corporate identity pieces; marketing materials; traditional print products; and newsletters and manuals. And that's only the beginning. Click on the links below to see samples from our portfolio. Full color printing is the foundation of our business. 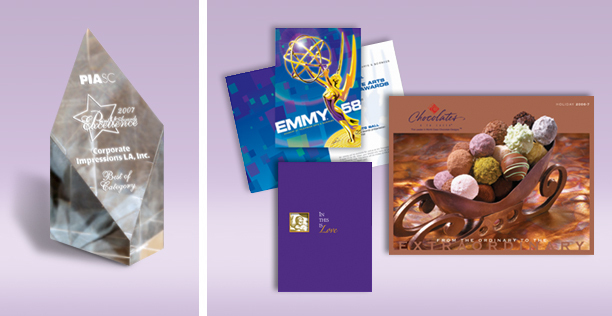 Corporate ImpressionsLA has been providing superior quality print solutions in Southern California for over 28 years. Our full service printing facility enables us to give you the products you need when you need them. Employing leading edge technology, including Kodak Staccato, makes it possible for us to produce award winning print materials. Our equipment generates time honored full color lithography, wide format printing and computer to plate digital output. Our press team embosses, foil stamps, die cuts and finishes your project based on your specifications. Our creative design team, software and technology work for you to turn your vision into a press ready file. Whether you need assistance with classic print materials or compact disc packaging, we have the design tools to bring it all together for you. Our finishing department does just that. Once your product is printed, we emboss, foil stamp, die cut, bind, fold, laminate, mount, score, stitch, shrink wrap and deliver your project. Does your job require the big presses? Digital printing can be faster and more cost effective for smaller print jobs. We can help you make that decision. To better help you manage your marketing materials we provide storage and mailing services to your destinations. We're glad you're visiting our website and we want to make doing business with us even easier. Feel free to request estimates, place orders or check out your document library via our secure customer portal system. You can also transfer large files via our site. All of these functions enable us to give you faster turn around times for your projects.